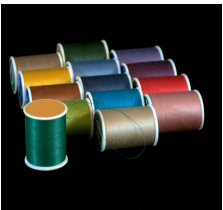 Sewing thread is a ply or cabled yarn used for stitching of apparels, hosiery, embroidery, footwear, leather goods, quilted mattresses, sports goods, saddlery & harness, industrial Gloves, automotive seats/seat belts, upholstery, parachutes, sails, tents, etc. Sewing threads are made of natural fibres like cotton, silk or artificial fibres like Nylon, Polyester or their blends. An ideal sewing thread should conform to a high standard of single thread strength, perfectly balanced twist and colour fastness. Sewing thread being a key component in the stitching, the demand for sewing thread is derived from various end applications such as apparel, hosiery, embroidery, footwear, leather goods and many other industrial goods. Shoe lace is a band that pulls the shoe together to hold it to the foot. A shoelace consists of two components: a tape that pulls the shoe tightly together and an aglet, the hardened taped end that fits through the eyelets on a shoe or boot. Shoe laces are also known as shoestrings or boot laces Shoe Laces also find application in garments (kids wear), shopping bags, office stationary, home decoration etc. However the consumption in these applications is negligible as compared to that in the footwear industry. Shoe laces are primarily made of Polyester, Cotton and Nylon. Polyester shoe laces dominate the market because of higher durability and better anti-slip properties. 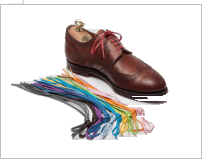 Cotton shoe laces are waxed to improve their performance and appearance. Interlining may be woven, knitted or nonwoven made out of cotton, polyester, polyester/cotton or polyester/viscose blend. Nonwoven interlining is available in weight ranging from 18 gsm to 70 gsm whereas woven interlining is available in weight ranging from 120 gsm to 250 gsm. 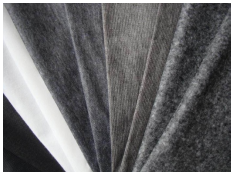 Both woven and nonwoven interlinings are available in fusible as well as non-fusible varieties. Zip fastener is a commonly used device for binding the edges of an opening of fabric or other flexible material, as on a garment or a bag. It is used in clothing (e.g., jackets and jeans), luggage and other bags, sporting goods, camping gear (e.g. tents and sleeping bags), and other items. This is the most common type of garment label. It is used when finer images or texts are required. It gives greater clarity, in detailed designs and texts. These labels are woven slower, with finer yarns, and higher weave density, than other labels, thereby giving a uniform weave, with added durability. Satin clothing labels are usually less expensive than damask. They cannot present the detail of design of damask or taffeta labels, but offer a smooth, shiny, lustrous, soft appearance, and feel. These labels are woven with a plain weave ground or base. This is a tight weave structure and produces a very stable, durable label. On this ground weave the design can be produced by a brocade weave effect. These labels are often used for care instruction labels, because of their low cost.